I read that bacon and kale are over. Yes, they both popped up in all sorts of recipes this past year, even one of my own. While I'm sure no one is really upset to learn that kale has been given a rest I beg to differ on bacon being done. Perhaps it won't be added to everything under the sun, but being over, really? I think not. If you choose that to be the case in your household, then so be it, but bacon will never be over in mine. Case in point is this addictive Brown Sugar Bacon recipe. It is best to have people in the house to help eat it or you might just eat it all yourself. Which is pretty much what I did because Addison had gone back to school and Maddie was so busy with school and activities that I had way too much time alone with the bacon - not a great thing for the waistline. I dare you to eat just one piece. It is nearly impossible. The bacon is done in the oven which frees up stove space to make eggs, pancakes or french toast. Just pop it in the oven while you prepare the rest of the meal or it can be made well in advance and left at room temperature until ready to serve. It makes a perfect addition to a brunch buffet or mix it up a little and serve it with appetizers and drinks. 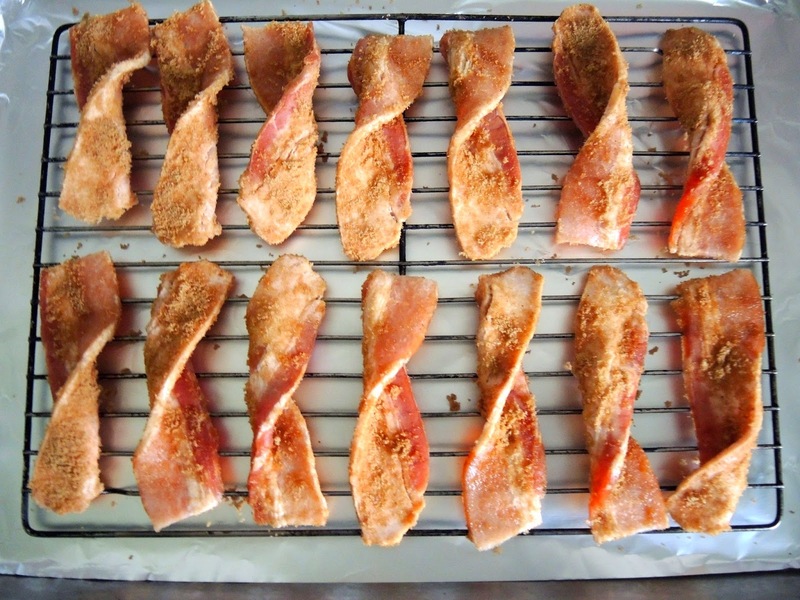 Thin-cut bacon can be used instead of thick-cut, but reduce the baking time to 15-20 minutes and watch closely as the brown sugar burns easily. The pepper is optional, but it adds a nice spicy kick. I used chipotle pepper, but fresh-ground black pepper or cayenne work just fine. I love applewood smoked bacon, so that is what I used, but any bacon will do. Preheat the oven to 350℉ degrees (175℃ ). 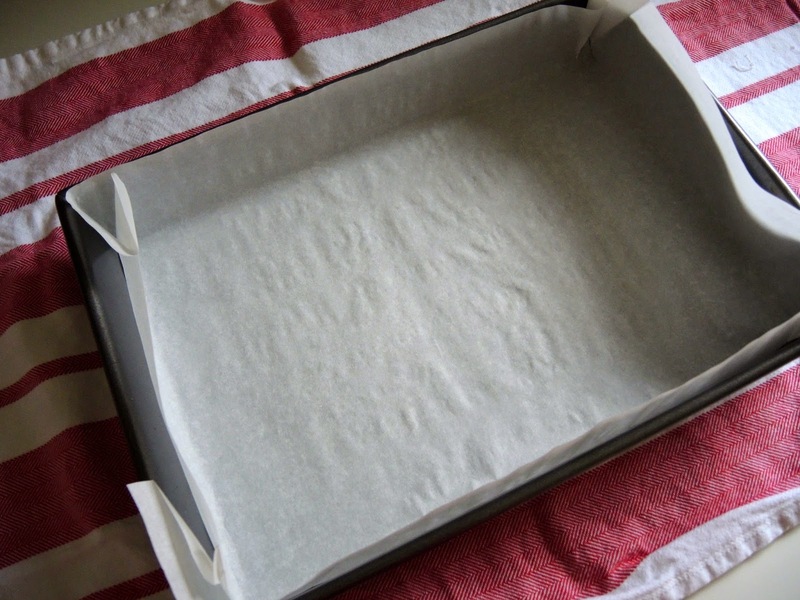 Cover two rimmed baking sheets with aluminum foil and place cooling rakes on top of the foil in the trays. Mix together brown sugar, cinnamon, and pepper (if using) in a large shallow bowl. Cut bacon in half crosswise with a sharp knife. 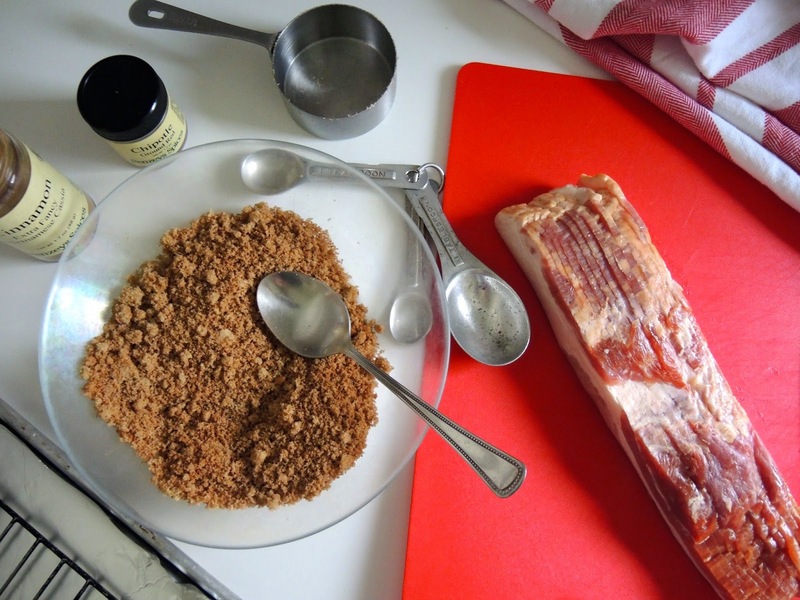 Coat each piece of bacon thoroughly with the brown sugar mixture. 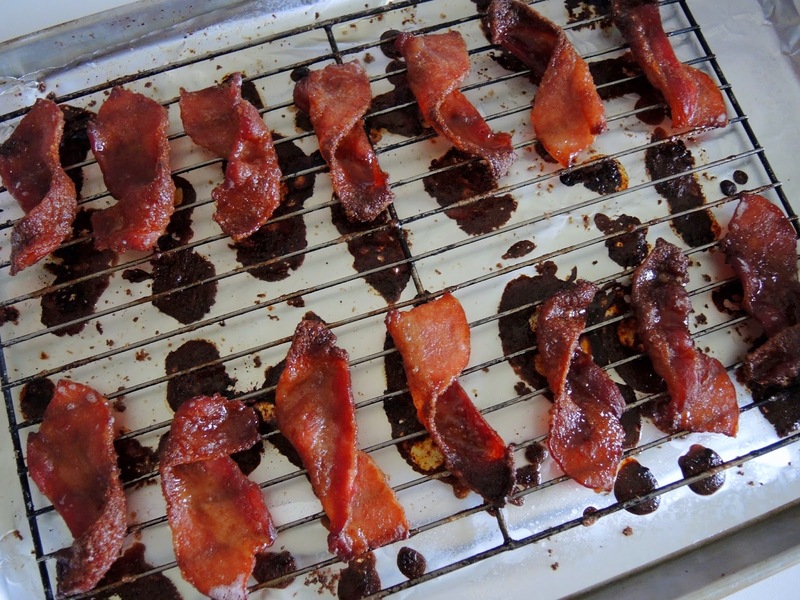 Twist bacon once or twice in a spiral and place on the rake over the foil covered baking sheet. Bake for 25-35 minutes rotating the trays for even cooking until the bacon is to the desired crispness. Watch closely as the brown sugar burns easily. Allow to cool before serving. 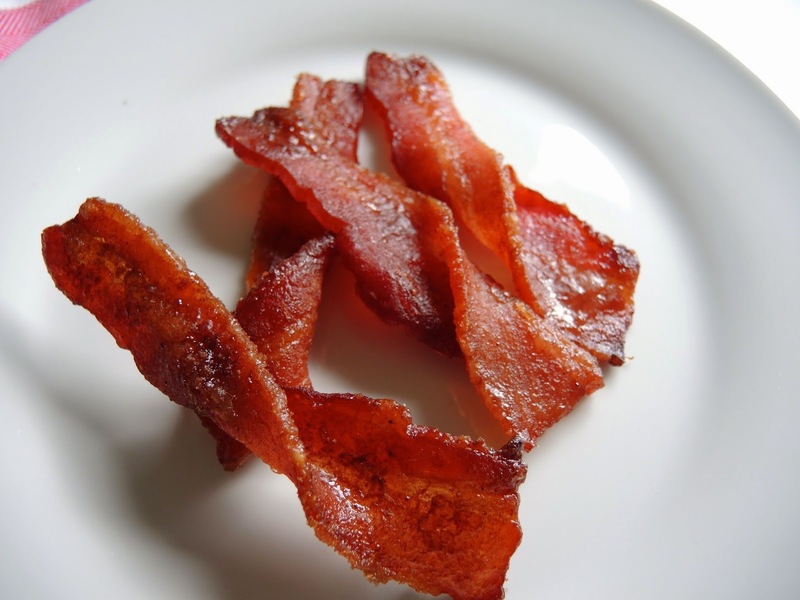 The bacon can be made ahead of time and left at room temperature until ready to serve. The birthday celebrations continue in our post-holiday household. While my Father chose pie and Maddie chose cake, Addison went with a more portable birthday treat - brownies. That way he could take them back to school to enjoy for as long as they would last. As a Master's student he has much to celebrate. He will graduate in May with a degree in Architecture and go off to make his mark in the world. 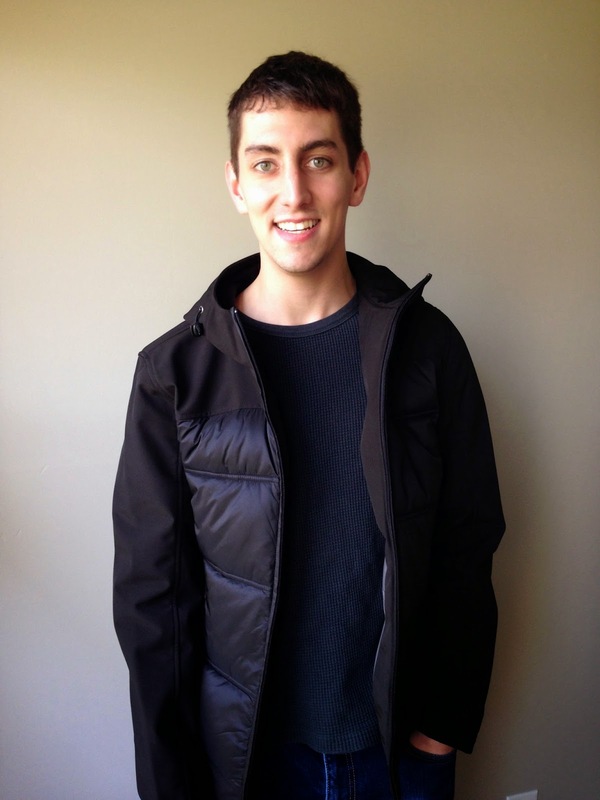 Addison is bright, clever, gets along with everyone, and has a great sense of humor. I have no doubt he will do well in life. Did I mention he loves food? Always willing to be a blog guinea pig, he will eat just about anything. Which isn't difficult with this recipe. 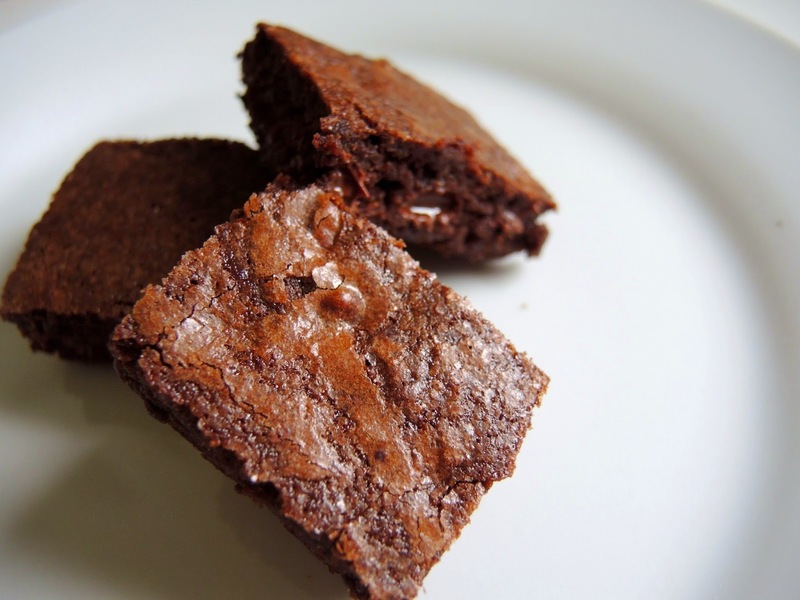 Really what's not to love about a brownie? It is dense, rich, chocolaty goodness wrapped up in a bite or two. They travel well and go down with ease which make them a perfect treat. 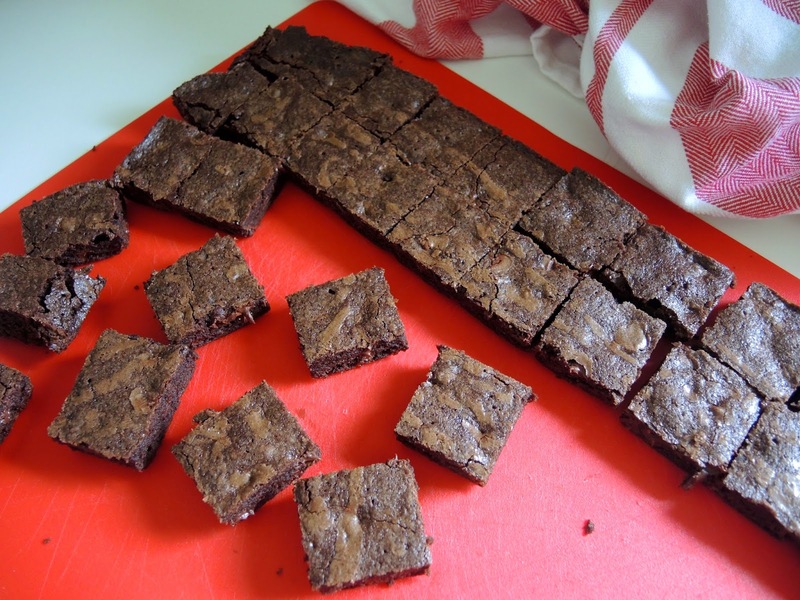 9 x 13 (23 cm x 33 cm) pan because more brownies are better. For an extra punch chocolate chips are folded into the batter, but this recipe lends its well to any kind of mix-ins - like left-over Christmas candy. Candy canes, chocolate from Christmas stockings, nuts or dried fruit would be tasty. Simply rough chop any add-ins and let the fudgy batter do the rest. 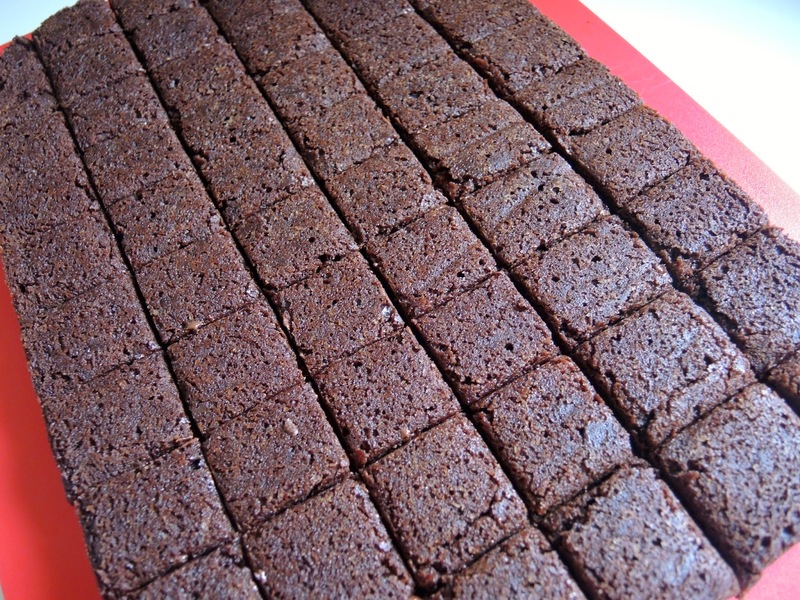 If you line the pan with parchment paper the brownies are easy to remove and cut and clean-up is a breeze. I find it easiest to flip the pan over and mold the parchment paper around the outside first. Then turn the pan over and fit inside. Lightly spray the inside with cooking spray to make removing the paper from the brownies easier. Preheat the oven to 325℉ (163 ℃). 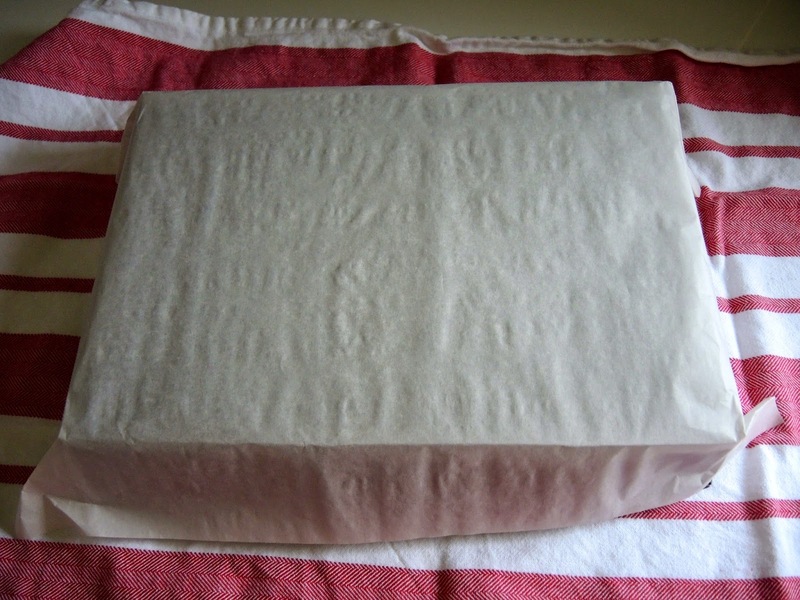 Line a 9 x 13 (23 cm x 33 cm) pan with parchment paper and spray lightly with cooking spray. 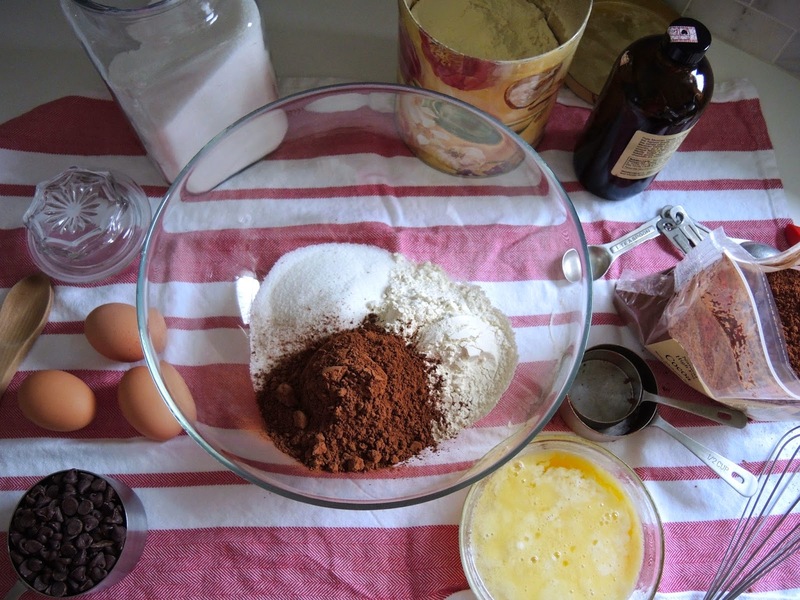 In a bowl whisk together cocoa powder, flour, and sugar. Add eggs, melted butter and vanilla. Stir to combine, just until blended. Fold in the chocolate chips. Spread into prepared pan. 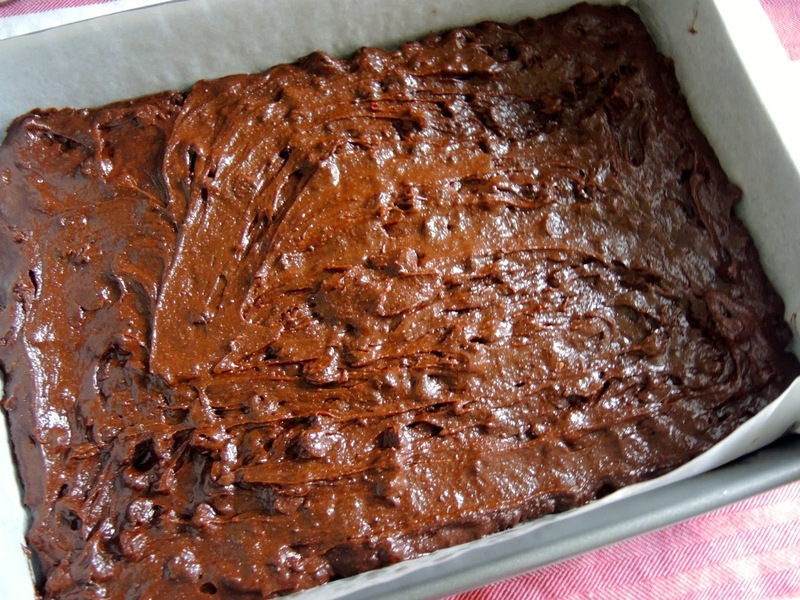 Bake for 20-25 minutes until a tester comes out clean. Allow to cool in the pan on a rack. Remove from the pan, turn upside down on a cutting board and carefully remove the parchment paper before cutting into squares. Store in an airtight tin at room temperature.